Ductless mini-split air systems bring added comfort to your home while creating a drier environment free from New York humidity. 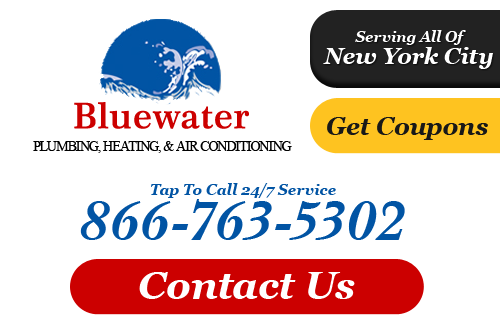 Bluewater Plumbing, Heating, and Air Conditioning can install ductless mini-split air conditioners in both residential and commercial properties no matter how large or small. 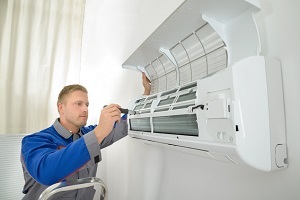 Our Queens air conditioning company's team of specialists are certified to perform installation, repairs, and ongoing maintenance for all types of ductless mini-split air conditioning in Queens and the surrounding areas. As the name implies, there are no ducts with the mini-split air conditioning equipment. The blower unit is compact, taking up much space than a traditional air conditioner and can be installed in a variety of places such as walls, floors, or ceilings. This system is connected to the outside condenser unit much the same as a traditional air conditioner. The refrigerant lines are insulated conduit. They have added features for operation. You can control each individual room as you wish with a remote control device, and you can install them in one room or the whole home. The Ductless Mini-Split Air Conditioning system offers flexibility for your air conditioning. They can function as either the primary cooling cooling unit or as a supplement to your current A/C. They simply require a wall space or window that routes the exhaust air directly to the outdoors. And as a primary cooling system, the installation will cool your entire home. Ductless systems are efficient and require little effort install. Manufacturers have developed ways to make a more compact mini-split unit to cool and heat homes effectively and efficiently. With today’s technologies, they have succeeded in designing and building ductless mini-split air conditioners. With controlling each room easily, ductless AC units ensure you a have quiet operation as well. With its flexibility, quiet operation, slim profile, and easy control, mini-split systems are a smart choice. If you are interested in an estimate for the ductless air conditioners we have available, or would need any other type of air conditioning services in Queens or the surrounding areas, please give us a call today! If you are interested in an estimate for ductless mini split air conditioning in Queens or the surrounding areas, please call 866-763-5302 or complete our online request form.